This tampan displays, at the bottom of the textile, a simple boat shape surmounted by two enormous creatures. These are probably snake-like creatures with two legs, suggesting that they may also have bird characteristics. The serpent ('naga') is associated with creation myths, death, and resurrection or birth. Between the serpentine forms are stylised forms, which may be a combined human and tree form, the latter representing the central axis of the universe and the tree of life. The hook motifs are common space-fillers on tampans. Large images combined with simple borders that include paired dots are typical of Komering tampans. The most common of the Indonesian “ship cloths” are the tampan, which are small cloths (approximately thirty to 100 centimetres per side) woven in plain weave of undyed cotton and decorated with supplementary weft yarns of dyed cotton or silk. Although ship motifs predominate, other popular designs include mythical birds and creatures, horse and rider motifs, and abstract interlocking and repeated patterns. 'Tampans', as with other, larger ship cloths, were important in various ceremonial and life-cycle contexts, and were particularly used during rituals associated with life transitions such as birth, circumcision, naming, initiation, marriage, and death. During these events, the tampans functioned as food wrappers, seat cloths, gifts, and ceremonial hangings. Many tampans exist because they were given away in great numbers during ritual ceremonies to mark events and to connect lineages through instances of reciprocal exchange. A family’s rank was demonstrated by the number of tampans that it was allowed to display publicly. Rank came from the number of connections that a family had with other families. There are three main styles of tampan, which come from the Komering, Kalianda, and Kota Agung/Liwa regions on Lampung (Chris Reid, personal communication, April 2011). Images of humans, animals, ships with high prows, and buildings appear with varying levels of realism. Key and spiral details are important as borders and space fillers. Red colour was the most usual, but the Liwa and Kota Agung region commonly used red, blue, and yellow. The base fabric of the tampans is cotton and it is woven in a plain weave. The designs are produced with supplementary (extra) weft threads that are inserted during the weaving process. In the Liwa region, the supplementary yarns were silk produced by the local industry. Tampans from the Kota Agung region are characterised by broad borders with blue bands of scrolling. The design in the central panel is often rigid-looking. The Kalianda tampans have only a few patterns framing the central panel, which is usually an elaborate boat overflowing with buildings, people, and animals. Backgrounds contain dots or similar space-fillers. The people from the Komering region in the central part of Lampung make tampans with a tri-partite form and rows of dotted motifs at the edges of the cloths or central panels. Komering tampans also have large, bold designs and narrow, simple borders. Many of the areas of Lampung were severely damaged by the volcanic eruption of Krakatoa in 1883, and most areas stopped producing tampans around 1900. The Komering region was less affected and seems to have continued making tampans until the 1920s (Chris Reid, personal communication, April 2011). 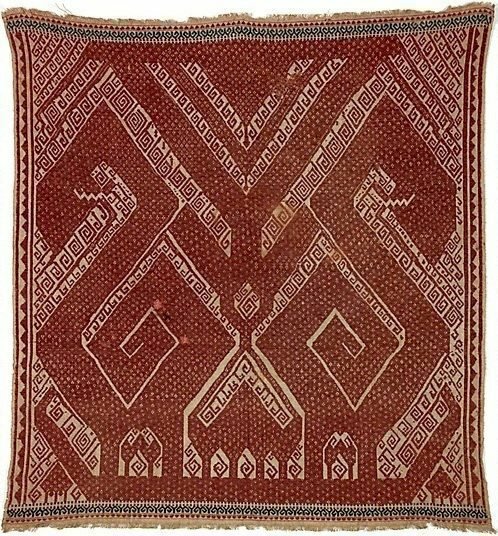 An interesting feature of the Lampung tampans is their similarity to textiles made by Tai people (an ethnic group that occupies northern Thailand, Laos, eastern Burma, and Southwestern China) from northern Thailand and Laos in mainland Southeast Asia. The connections include design, function, and weaving structures. 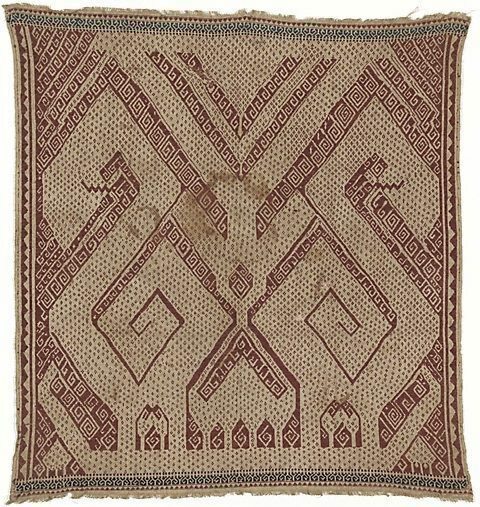 A number of Tai textiles, including pillows, shawls, and banners, like the Sumatran tampans are made of plain weave with supplementary weft decoration. Patterns used by both regions include hooked lozenges, key fret designs, s-scrolls, diamond configurations, eight-pointed stars, and scalloping. Many tampans look similar to the cloth squares and shawl ends found among the Tai. In gift exchanges, tampans are paired with mats, which does not occur elsewhere in Indonesia, but in Thailand pillows and mats are donated as a pair. The Sumatran practice may have come from the Tai people about 1,000 years ago (Mattiebelle Gittinger, 'To Speak with Cloth', pp. 225–239). It was probably transmitted by merchants active in the extensive trade networks that connected India, China, and Southeast Asia. Links with mainland Southeast Asia are not the only ones shown in the tampans. Some designs come from Indian trade cloths, particularly the patola cloths which were popular and ritually important in Southeast Asia. The Asian Collections Art Gallery of New South Wales , Sydney, 2003, 344 (colour illus. ).